Come on in, and don’t worry about your shoes,” says Lenore McLean of her family home. She appears slightly amused that someone has taken an interest in writing about her home. 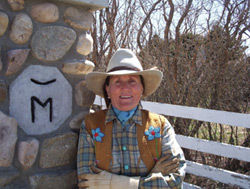 Lenore is used to being interviewed because of her accomplishments as a competitive rider, as one of the three rancHERs of the Alberta Cattle Commission’s “If it ain’t Alberta it ain’t Beef” campaign, and as co-owner with her husband Roy, of 46 years, of Stimson Creek Ranches, a busy working ranch and popular guest ranch. A woman who was once honored by Canada’s Governor General for contributions to Canada and the community has a fabulous sparkle in her eye and laughs when asked what her home’s style is. So what does the Roy and Lenore McLean ranch home look like? Nothing spectacular – it’s just a sixty-year-old farmhouse that Roy’s parents built when they moved out west. The steeply-pitched rooflines and enclosed sun porch are more reminiscent of houses on the east coast than the prairie. The two-story house sits high up in the eastern slope overlooking the rolling hills and distant mountains, not far from where the original log house built by Scottish homesteaders once stood. The barn built in 1928 still stands in perfect working order. The house is a place where you can envision family and friends have gathered time and time again to celebrate the end of harvest, the beginning of calving season, to welcome newborns to the family, to mourn the loss of treasured relatives, to celebrate another victory in the riding arena, to lay out plans for the next community fundraiser. If these walls could talk…but wait they do! Every available wall space is filled with photos – images from bygone days cataloguing a family love affair with the horse, the land and the spirit of the west. 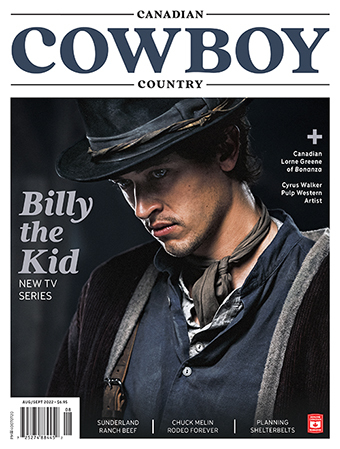 There are intimate portraits, poses with trophies, publicity stills and framed news clippings. There are paintings and plates, ribbons and the obligatory cowboy hats hanging in every corner. And there is nothing pretentious about any of it. It’s a simple testimony to lives that have been lived to the fullest shared by loved ones and celebrated by many more. If you look closely you delight in your findings – early publicity shots of Flores La Due, the performing name of Florence Weadick, wife of Guy Weadick who is credited with creating the Calgary Stampede. Flores La Due is a prominent figure in the home of Lenore McLean. Lenore grew up on the ranch next door to the Weadicks who, with no children of their own, called Lenore and her four siblings family. 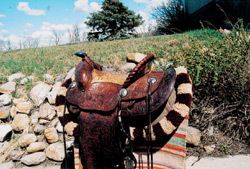 Lenore’s most cherished possession is Flores’ custom-made performing saddle. 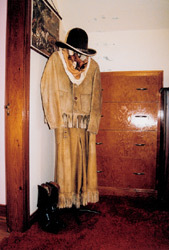 At the top of the landing upstairs, is a fringed, leather ensemble and boots Flores would wear in competition and shows. All over the house there is a surprisingly high percentage of imagery, paintings, porcelain and china devoted to the foxhunt and English riding. Many of the pieces you see now, have been passed down to her from her English and Scottish ancestors. Lenore explains that her mother and grandmother both rode English. In fact Lenore’s father insisted she and her sister learn English before they learned to ride Western. A guest who discovered Lenore’s English background and love of the fox hunt sent a print of a traditional hunting scene and it was happily added to the collection. Lenore went on to compete successfully over the years showing her horses in both disciplines. Western pleasure, English pleasure, equitation class, trail, reining, and even sidesaddle. All three sons were involved in showing horses and the whole family would even compete in the family ride class – a category where families match their riding costumes, horses and ride abreast in the show ring. Trophies of all shapes and sizes are lined up next to wedding crystal; ribbons lay out next to china plates. When Roy and Lenore took over the ranch house, one of their first projects was a massive outdoor fireplace that is still in use today for grilling steaks and orientation coffee breaks for the agricultural tours that Roy and Lenore have been hosting for over fourteen years. “Being a farm means diversification is always a necessity,” says Lenore by way of explaining their initial involvement. Today the guest ranch just across the road and down the hill is a steady side business. Photo albums are chock full of letters, postcards and photos sent by grateful visitors from as far away as Zimbabwe who have enjoyed the McLean family hospitality. Little has changed to the original house structure save for an addition of a family room when the boys were growing. The room’s most prominent feature, a handsome stone fireplace, is made entirely of stones found in the surrounding fields. It’s solid and from the outside of the house you can see its full extension up past the roof. One of the favorite pieces of antiquity in this room is the hanging brass kerosene lamp with dual lanterns. Originally from New York in the 1800s, it was part of the Weadick ranch and was passed on to Lenore’s father who cherished it for many years. In the more formal front living room the antique pieces are the real features. Lenore points out that most of the furnishings are from Scotland handed down to her and Roy from both their families. The piano in the corner was a wedding present to Lenore from Roy’s great uncle. An 1850s washstand became a table to hold a Dresden lamp, one of several Lenore has collected over the years. There is a commanding Jack King painting on the far wall that competes only with the view to the west of the mountains. Much of the artwork is local, Lenore points out. Roy’s office is in the original enclosed sun porch and the highlight of this room is a rare Victrola that Lenore demonstrates still works with startling clarity. There are more artifacts, personal treasures and memorabilia in this humble home than most small town archives. Every item from the tiniest Beswick pony (trophies from showing ponies actually) and the seemingly insignificant silver teaspoon to the ornate Dresden lamps has a story to tell, a fond memory to share, a personal connection to the past, the present and the future. It’s a loving tribute to several generations of ranchers and farmers, of cowboys and cowgirls, English women and Scottish men…the family heritage of Lenore McLean.